Joe McNamara Henge, Achill, Ireland–Guerilla Henging Taken Up a Notch! Reportedly over six months in planning, the enormous circular structure, which is located on commonage land above Pollagh, was erected at great speed but with a high level of precision. A group of men, with McNamara in charge, worked long hours over the weekend on its construction. The projected cost of its manufacture and installation is believed to be in excess of €1 million. Fascinating! We eagerly await further developments. And, Mr. McNamara, we would not object to an exclusive Clonehenge interview. How often does henging meet the law? Any guerilla henger is a friend of ours! Henging–is it a new way to Occupy? Our thanks to Barry Teague and Pete Glastonbury for alerting us to this news. If it is allowed to remain there, this will, of course, be added to our list of large permanent replicas, our first in Ireland. Stonehenge in Brasil, at the Center for the Study of the Universe! Here it is, the 72nd item on our list of large permanent replicas and our first on the continent of South America. Didn’t we tell you that we knew there had to be at least one? This is another replica associated with a planetarium, often a good place to look for a Stonehenge replica, large or small. For example there is the one at Kuala Lumpur and the trilithon at the Chicago planetarium. Often, if you keep your eyes open, you can find a little Stonehenge somewhere around a planetarium. It’s a thing. You can see another shot of this replica here, where someone has come up with a wonderful new spelling: Stonehonge! Love it. And on another page describing the campus we found this bit: “also houses a replica of the small size archaeological site of Stonehenge, whose original is in England, and a replica of an Allosaurus.” Awesome. But what made us realise that we now totally want to attend this school, was the school’s website, here. It has one of those headers that revolves among several photos, and the second photo shows a couple of extremely buff, scantily-dressed blue-headed aliens! We bet they don’t have any trouble getting beer for keggers. And now for the henge itself. At first glance, the uprights are so narrow for their height that the casual observer might assume no one even actually looked at Stonehenge. A closer look, however, reveals to our delight that the trilithon horseshoe once again faces the three-lintel stretch in the outside circle. You get points for that, people! Remember that for when the Stonehenge virus overtakes you and you end up shoveling mud in through the window of your basement and building a Stonehenge while your spouse yells at you and grabs the kids and moves to his or her parents’ place. Which is really more important–keeping your family, or the score you get on the Clonehenge blog? That’s right, folks,–keep your priorities straight and make sure that the horseshoe faces the right way! Score for our Brazilian Stonehenge, 7 druids! We now have large permanent replicas on every continent but Antarctica, and since the snow and isolation there serve to activate the virus and force people there to build snowhenges on a regular basis (one example here, I think we’ve posted four so far), we’re not worried about that one. Unless someone can make us a penguin-henge. No, no–that would be bird abuse. Bad blogger!! Listen, please don’t take this to mean we’ll now be posting on a regular basis. We just have so many replicas stacking up that we had to relieve the pressure a little. Many thanks to all who send them. Don’t forget you can post your own pictures on the Clonehenge Facebook group. So get henging! And to you Statesiders, we wish you a happy Thanksgiving! And since today is the start of Clonehenge’s fourth year, happy birthday to us! We Now Have a Theme Song! Ylvis: What’s the Meaning of Stonehenge? This is so great we can’t express it in words. Watch it and weep! “What’s the deal with the Stonehenge?” Oh, almost forgot–not safe for kids. Who cares if they got a detail or two wrong? They even include the snow globe. That’s class. We now return you to our regularly scheduled lack of posting! Stonehenge of Oz: Esperance Complete! 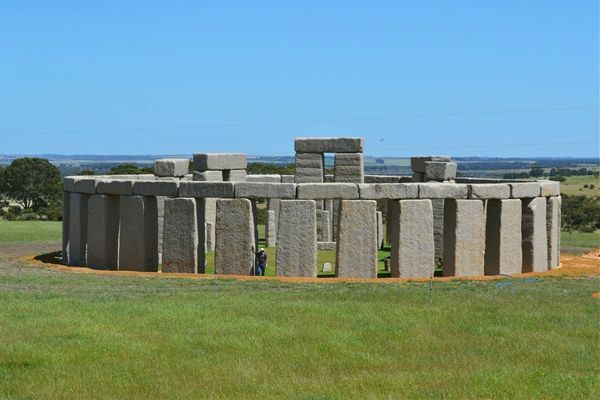 And now, well in advance of summer solstice down under, the Esperance Stonehenge replica in Western Australia has been completed, lintels and all, as seen here. Congratulations to the Beales, from everyone in the Stonehenge replica community, wherever that is! And, yes, it is not the only full-sized replica or the only full-sized stone replica, but, like all Stonehenge replicas it is, rather ironically when you think about it, unique. The stones are blocky and flat, but it’s still far better looking than the cement Stonehenge in Washington State. It reminds us a little of the Takino Stonehenge, one of the ones in Japan, except there’s no Buddha shrine inside. After watching this one in process for so long–since Ross Smith contracted for the stones, years ago now, it is with pleasure that we finally get down to giving it a score. 8½ druids for the Stonehenge of Oz! That is one of our highest scores, Well done. And to think they did it all while standing on their heads!